It’s no secret that superheroes can sometimes behave...less than super heroic. We’ve already discussed how Superman has been something of a super-jerk over the years, but he’s not the only boy-scout superhero that’s made a few big mistakes over the years. While the Cyclops seen in X-Men: Apocalypse (played by Tye Sheridan) might seem like a pretty clear-cut hero — and the lack of edge displayed by James Marsden's take on the character from the original trilogy made him downright boring at times — his comic book counterpart has done a surprising amount of selfish, not-so-heroic things over the years. 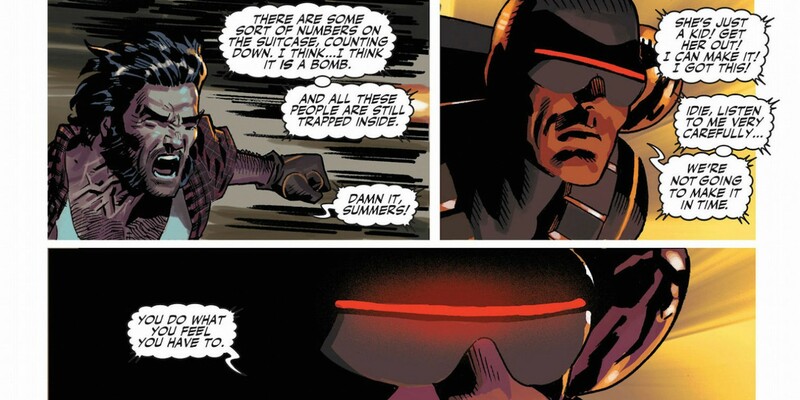 Here are 11 Times Cyclops Was A Total Jerk. As with Superman’s brief career as a pornographic actor, this entry is sort of cheating, as Cyclops was possessed by the Phoenix Force at the time and technically wasn’t acting under his own power. This is a common enough storytelling trope in comic books, and the X-Men's field general couldn't really be blamed for his actions. However, the massive amount of destruction Scott Summers managed to wreak in X-Men vs the Avengers certainly deserves a mention on this list. In addition to his battles with several superheroes in his super-powered state, he not only let Emma Frost die to claim her Phoenix energy, but he used his newfound powers to kill Professor Xavier. How did the X-Men even get into such a mess to begin with? In essence, the massive battle between the X-Men and the Avengers was kicked off by Hope Summers, a teenage mutant chosen by the cosmic entity known as the Phoenix Force as a host. The Avengers want to take custody of Hope and figure out how to contain the unstable energy, but Cyclops refuses to hand her over, claiming that she’s the messiah of all mutant-kind. Ignoring the total absence of any kind of prophecy about a “mutant-messiah,” Scott’s own history with the Phoenix Force makes his actions baffling: he saw the entity turn the woman he loved, Jean Grey, into a power-mad space goddess, one that takes out the entire team and uses her powers to destroy an inhabited planet. With that context in mind, the Avengers’ position of containment instead of literal worship isn’t just understandable, but incredibly reasonable, especially when the Phoenix Force possesses Cyclops and other mutants and instantly proves the naysayers right by going on a rampage. Oftentimes, hatred and resentment takes time to develop, as months, or even years, of perceived disrespect and contempt slowly build between two people. With Cyclops and Wolverine, on the other hand, it only took a few adventures before Cyclops decided it was okay to treat Wolverine with outright animosity. In Uncanny X-Men #126, the group is recovering from their fight with mutant powerhouse Proteus, who briefly possessed Wolverine. Seeing that his teammate is profoundly shaken from the experience, Cyclops eschews talking to Wolverine about the experience to aggressively provoking his PTSD through mockery and threats of force, believing that firing him up is worth the risk of breaking him. Wolverine’s decades upon decades of enduring unimaginable misery seem to suggest he might not have as much trouble bouncing back as Cyclops thinks, but even if Cyclops is right, his decision is still a poor one. Had Wolverine been as fragile as he thought and simply broken from the strain, accelerating the process would leave the team with an unpredictable killing machine to deal with alongside the demi-god level threat of Proteus. With how often the enemies of the X-Men either use clandestine hit squads against them or try to force the mutants into joining them, it’s truly puzzling that Scott Summers reasoned himself into believing that forming a similar group would be morally justified. The mere existence of the X-Force death squad is bad enough, but it gets worse in X-Force Vol. 3 #1, where it’s revealed that Cyclops has drafted Laura Kinney, aka X-23, into the squad. Laura was created as a human weapon whose sole function was for wet work, and under Cyclops’ leadership, the X-Men have put her right back into the life she often longs to escape. Good work, Cyclops. The one thing worse than putting a character like Laura Kinney back into a role as a human weapon? Doing it twice! In X-Men: Schism #3, Idie, a young mutant raised to believe that her powers made her a monster, is trapped in a building with a bomb and several hellfire club members. Wolverine, who’s sprinting to the scene as fast as he can, begs Scott to tell Idie to flee the scene, that he’ll take care of the Hellfire Club members. Instead, Scott tells Idie that nobody’s coming to help her and that she should “do what you feel like you have to.” Idie uses her powers to execute the Hellfire Club members, leaving the building just before the bomb goes off. Wolverine is furious at Cyclops for his decision to put a child in such a position, and it’s honestly hard to blame him. Idie believed that her powers weren’t good for anything but hurting people, and Scott forcing her to pull the trigger and take people’s lives certainly didn’t disprove that opinion. It’s rare that uncharacteristic bad behavior falls into a pattern, as this usually marks more intent on the part of the writers than one would assume, given how severely such things can damage the audience’s ability to be sympathetic. Cyclops is the rare exception: of all the bad things he’s done, the most common offense by far is emotionally abusing women in relationships through a stunning series of lies and toxic decisions, many of which begin in this spectacularly awful decision. Dating a woman that looks exactly like your dead girlfriend while you’re still reeling from your loss seems like a poor idea -- and many of the people in Scott’s life tell him so, repeatedly -- but marrying them and settling down, as Cyclops did in Uncanny X-Men #175 is far, far worse. Scott put Madelyne in an awful position, setting her up for inevitable distress when he realizes he’s projecting his love for Jean and tries to escape his marriage. Soon after Madelyne gives birth to a child (the hyper-powerful, time-traveling mutant, Cable), Cyclops begins taking every chance he can to abandon his responsibilities, putting his life in danger on missions with the X-Men while knowing that he’d be leaving a wife and infant son behind should anything happen to him. With his son still in diapers, Scott recieves a stunning revelation: his old flame, Jean Grey, is still alive, and she wants him to join her on a new team of crime-fighting mutants, X-Factor. The choice Cyclops faces in X-Factor #1 is clear-cut: he can either stay with the wife and son he claims to love, build a new life, and move on from the past, or abandon them for a woman he hasn’t seen in years, with basically zero explanation as to why he left. In a stunning moral failure, Cyclops makes the latter choice, not only abandoning his new family but hiding their very existence from Jean Grey as they settle back into their old relationship. Classy. For all the horrible things he has done for her, it would be reasonable to assume that Cyclops is absolutely devoted to Jean Grey, and would never betray her trust. The events of Grant Morrison’s New X-Men prove such assumptions as hopelessly incorrect. What begins as psychological counseling between Cyclops and new telepathic teammate Emma Frost soon blossoms into a full-blown psychic affair, with the couple engaging in regular trysts in a mental-emotional realm. When Jean discovers the affair, Scott actually has the gall to defend himself with the claim that his infidelity wasn’t physical, which ignores how his actually indiscretion is far, far worse. Scott didn’t betray Jean -- who's his wife at this point -- with anything as mundane as physical infidelity, but instead violated her trust by opening up the entirety of his inner self to another person. ....and discovers Scott passionately necking with Emma Frost. Wolverine’s words -- ”What part of the mourning process is this” -- are as cutting as they are valid. Cyclops’ response? To use his powers to blast Wolverine out of the window, presumably to continue “mourning” his wife by kissing the woman he cheated on her with. The only way it could possibly be worse is if he was literally making out with Emma Frost on Jean Grey’s grave. This moment is very clearly not intended to make Cyclops look like a jerk. There’s a lot of build-up showing how conflicted he is emotionally about his wife’s death and his feelings towards Emma Frost, and Jean even contacts him from beyond the grave to encourage him to move on. But the moment is ruined with the shocking image of Cyclops literally kissing his former mistress on his wife’s grave. This moment serves as a perfect metaphor for Cyclops’ surprising number of relationship mishaps: his refusal to commit, his utter disregard for former lovers once he’s done with them, and his inability to learn from any of his mistakes are all on full display here. An image so callous as to be unbelievable, Scott cementing his new relationship by desecrating his old one has to be just about the worst thing he’s ever done.